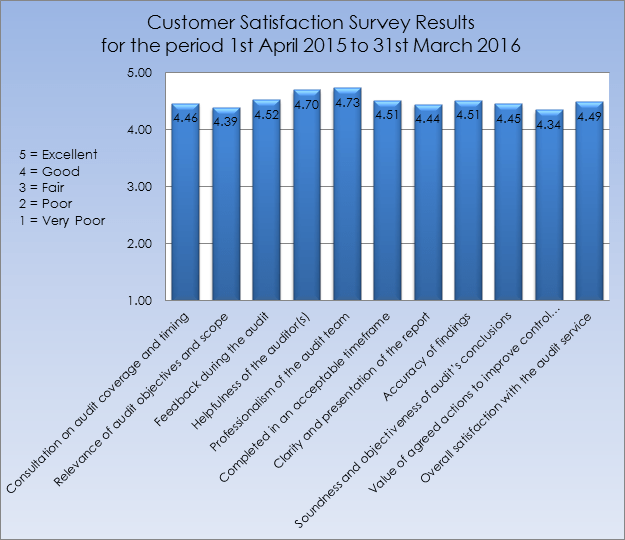 For this Plan year, the average customer satisfaction survey score was 49.6 out of 55. Our target has been set at an average of 48. Overall, 60 of 82 responses categorised the audit service they received as excellent, another 21 responses categorised the audit as good and only 1 audit was categorised as fair. Completely happy with the service and advice provided. The Auditor completed this work in a professional and competent manner, explaining and discussing issues as they arose. It was obvious that auditor had a comprehensive understanding of the area being audited and the advice given was extremely helpful. Audit completed in record time, with clear recommendations enabling us to improve our processes at the start of a long term supply contract. The Audit was undertaken in a friendly and professional manner, the auditor made every effort to understand the operational needs and conducted the audit in the least intrusive manner possible.